Supporters of Kem Sokha, leader of the Cambodia National Rescue Party (CNRP), stand outside the court during a hearing for the jailed opposition leader in Phnom Penh, Cambodia, Sept. 26, 2017. Around half of the opposition members of Cambodia’s parliament have left the country in fear of a crackdown by Prime Minister Hun Sen’s government, a deputy party leader said. 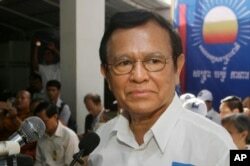 The leader of the Cambodia National Rescue Party (CNRP), Kem Sokha, was arrested Sept. 3 and charged with treason for an alleged plot to take power with U.S. help. The government has said there could be more arrests linked to the alleged plot, which the opposition says is just a ploy to ensure Hun Sen keeps his more than three-decade hold on power in next year’s general election. Hun Sen’s ruling Cambodian People’s Party (CPP) has a slim majority in the 123-member parliament, which voted Sept. 11 to allow the prosecution of Kem Sokha in a vote boycotted by opposition members. She said the party was still in contact with those members outside the country as the opposition tries to rally international pressure on the government. A spokesman for the ruling party said it was an internal issue for the CNRP if its members were abroad. Spokesman Sok Eysan said the CPP believed in a culture of dialogue but Kem Sokha’s “criminal act” had destroyed it. “The ship has left the port so it’s already too late,” said Sok Eysan. The government has said Kem Sokha’s party could be dissolved if it doesn’t drop him as its leader, something the CNRP has said it will not do. While Western countries have condemned the arrest of Kem Sokha and called for his release, Hun Sen has support from his close ally China, by far the biggest donor to one of Southeast Asia’s poorest countries. Mu Sochua said she was still hopeful that Western countries would take stronger action against the government, but did not specify what. “A statement alone is not going to help,” she said. The evidence presented against Kem Sokha so far is a video from 2013 in which he tells supporters that he has support from unidentified Americans for a plan to gain power. The opposition says it is evidence of an election strategy, not a coup plot.